Your adviser can provide help with scheduling. Creating a schedule that works for you can make all the difference in your time management and success in college. 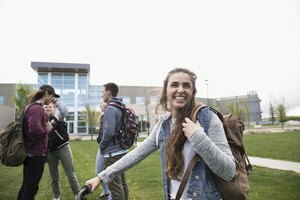 The flexibility of scheduling in college gives you more freedom, but you also have more factors to balance, including time of day, time between classes and other responsibilities. Evaluating the factors will help you arrange a class schedule that is ideal for you. The university sets specific class requirements for each major, as well as general education requirements for graduation. When you schedule your classes, focus on the required classes first. 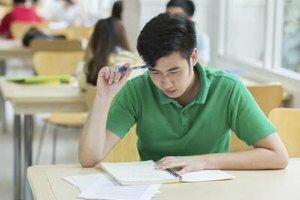 Getting those classes out of the way early in your college years means less scrambling to cram them in before you graduate. As you move through the program, advanced classes often have prerequisites that you need to complete first. Planning ahead ensures that you have all of those basic classes out of the way early. Highlight the required classes in the course guide to help lay out your schedule. Meeting with your adviser is a key component in the scheduling phase. Your adviser will help you choose classes and can clear up any confusion on the requirements for your degree. Your classes take up a large chunk of your schedule as a college student, but you likely have other commitments to consider. Many students have part-time jobs to help make ends meet. If you can only work certain hours, plan your class schedule around those times. Even if your work hours are flexible, leaving a large chunk of time for your job makes your work time more efficient. If you are a student athlete, practice times and commitments are another factor. 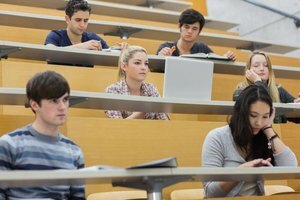 For college students involved in organizations, scheduling classes around regular meeting times or events is another consideration. For example, if your student running club meets every Wednesday afternoon, block out that time so you don't schedule classes then. Classes at most universities start at 8:00 a.m. and continue throughout the day. Evening classes are also an option. Some of your required classes may have only a few time options, but others will include multiple sections so you have flexibility in your scheduling. Choosing class times during your peak performance allows you to better focus. If you struggle to get out of bed in the morning, avoid scheduling early classes that you're more likely to skip. Night classes often meet only once per week for two or three hours straight. You can knock out a whole week's worth of class in one night, but if you can't sit and focus for that long, a night class probably isn't the best option. Laying out a schedule can take some time because class times overlap and classes may fill up before you can register. In most cases, to be a full-time student you need to carry at least 12 credit hours per semester. Tempting as it is to add more classes so you can finish earlier, overloading yourself will give you less time to study. Scheduling a mix of difficult and easy classes will keep your semester balanced so you don't get overwhelmed. Also, making an alternative schedule with backup class options is useful in case classes are full before registration is open to you. Frost, Shelley. "How to Schedule Classes for College." Synonym, https://classroom.synonym.com/schedule-classes-college-5069.html. 26 September 2017.